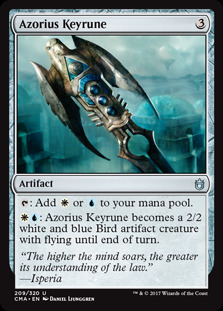 : Azorius Keyrune becomes a 2/2 white and blue Artifact creature with flying until end of turn. Cascading Cataracts, Temple of Enlightenment, Rogue's Passage, Halimar Depths, Drownyard Temple, Deserted Temple. If your goal is to get Noyan out as fast as possible, why is there so little ramp? 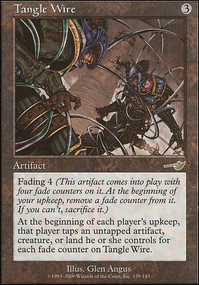 A few that come to mind: Commander's Sphere replaces itself when faced with removal/becomes superfluous. Azorius Signet because signets are phenomenal, Azorius Keyrune is a creature when you want it to be. Feroz's Ban, Ghostly Prison, Propaganda, and the like protect you. Granted, they aren't instants or sorceries but they warrant consideration. robotbird123: I guess it teaches noobs to RTFC. And I was looking for a decently powerful ramp source that was common. I'll swap it to something different. Maybe Azorius Keyrune because it's modular. Can swap between ramp and beats. 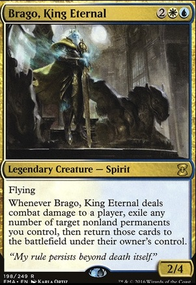 Might want to consider using Unquestioned Authority instead of or in addition to your Spirit Mantle, so you get a cantrip effect in addition to the protection from creatures effect. You might also want to consider adding in a couple more mana sources, whether those be lands or artifacts, as 6 mana can take a while to reach, let alone enough mana to both cast it and protect it same turn, and then you're in trouble if your commander somehow dies. Perhaps Azorius Cluestone or Azorius Keyrune, so they won't be a dead card if you find you have plenty of mana. There are 113 cards in your deck...I'd say that the deck has quite a lot of stuff going on. 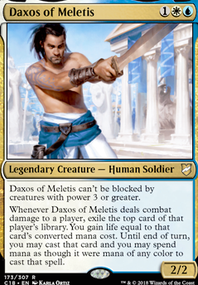 There are some pieces for stax, some for more combo-y decks, and others don't seem to belong. 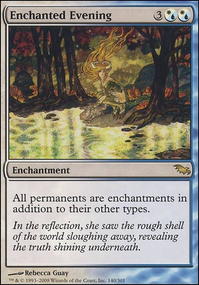 I'd advise for things like Tundra and Hallowed Fountain because dual lands are a big starter and allot for more flexibility. Azorius Cluestone and Azorius Keyrune could be taken our for Mana Crypt. Btw, what is the wincon here, just wondering. 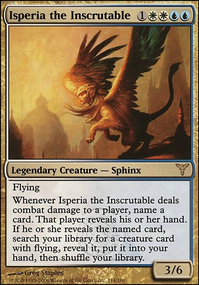 I think Sphinx's Tutelage is odd here. You don't have any other mill so its unlikely to do anything except annoy someone and doesn't work with your Necropotence because you stop drawing cards. Next I would play more lands personally. I like to run 35-37 depending on how many mana rocks I'm playing. I'd replace Azorius Keyrune with Azorius Signet. Cards like Diplomatic Immunity (Zur's ability lets auras he tutors up attach to him even if he has shroud! ), Steel of the Godhead, and Shielded by Faith are great ways to protect Zur so you can keep attacking with him every turn. Here's an initial potential cutlist of cards I don't think synergize well with your goal, or have direct better upgrades: Elgaud Shieldmate Essence Warden Phantom Nantuko Phytohydra Fade into Antiquity Mouth / Feed Revoke Existence Lifecrafter's Gift Frozen AEther Primal Rage Lightmine Field Azorius Keyrune Obelisk of Bant Selesnya Keyrune. There are some others I'm not sure on but those will have to be chosen on based on what direction you choose to go with this.